It is a freeware all PDF documents to be simply converted into a range of formats. 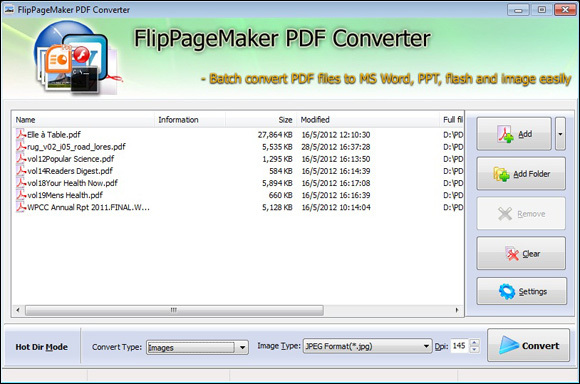 Convert PDF to other file types such as Microsoft Word, PPT, Adobe flash and image. The PDF conversion type image includes BMP, JPG, TIFF and BMP. It lives up to the reputation of PDF to Any converter of universal and easy-to-use. It supplies with the most complete solution for conversion of Microsoft Word and PPT. It differs from other converters because the 3 modes for batch and rapidly processing. 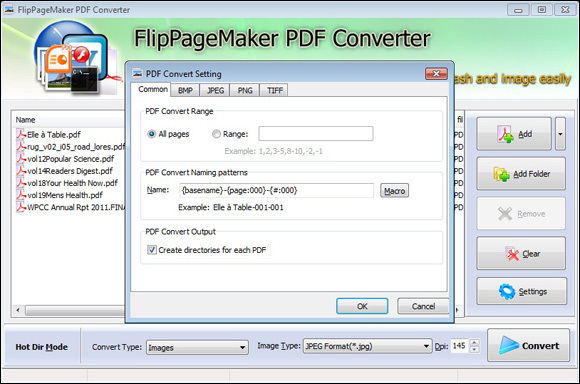 FlipPageMaker PDF Converter is a fast application designed specifically to convert non-editable PDF file to other document types, such as Microsoft Word, Microsoft PPT, Adobe Flash, and Image (jpg, bmp, tiff and png). The 3 modes Batch Convert, Command line and Hot Directory are free to choose which upgrade efficiency. To edit and modify PDF content with Word or PPT, it fully supports Microsoft 2012, 2007, and 2003. No Adobe Acrobat or Adobe Reader is required. 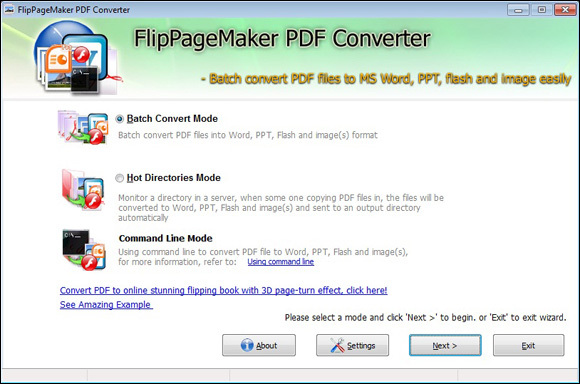 1 Batch Convert Mode: Batch convert PDF files into Word, PPT, Flash and image(s) format. 2 Hot Directories Mode: Using command line to convert PDF file to Word, PPT, Flash and images(s). 2 Command Line Mode: Monitor a directory in a server, when some one copying PDF files in, the files will be converted to Word, PPT, Flash and image(s) and sent to an output directory. 1 Convert PDF to Microsoft Word: Make editable Word documents from PDF with image, text, hyperlink, etc preserved. 2 Convert PDF to Microsoft PowerPoint: Make professional PPT presentations from PDF files. 3 Convert PDF to Adobe Flash: Make Adobe flash SWF magazines from Adobe Acrobat PDF. 4 Convert PDF to Image (tiff, bmp, jpg and png): Make images sorts of common format from the illustrated PDF. 1 Add single PDF file or folder of PDFs. 2 Remove individual items in the list or clear all. 3 Control the definite page range you will convert. 4 Define output items name pattern Macro. 5 Create directories for each PDF or hold all the out files in one folder. 6 Custom the parameter of 4 formats BMP, JPEG, PNG and TIFF. 7 Adjust the Dpi of the 4 output image formats. Why convert a PDF to a Microsoft Word, PowerPoint file, Adobe flash, or Jpg image? The answer lies in the way we view PDF document. 1 PDF requires an assistant widget for instance Adobe Acrobat Reader (or any other free variants) while jpg does not. 2 Common browsers have the built-in capability to display image while handling PDF requires an external application or plug-in which may or not be present. 3 An external application comes with the handicap of loading times. Plus the rendering of a PDF document happens only after the complete document is downloaded while image can be streamed in. 4 Office applications also do better job of handing image in comparison to PDF. E.g. a PowerPoint presentation with an embedded image goes faster than with a PDF document. Anyway, on special occasions converting your PDF to other format could be the solution we are looking for.